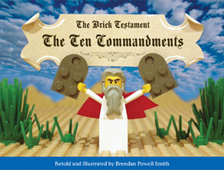 A small Philadelphia publishing firm has released the third book in a series of religious-themed, Lego-illustrated, slightly-irreverant books called The Brick Testament. They currently have books on Genesis, the Christmas Story, and most recently, The Ten Commandments. These books look great. If you’re going to purchase these books, please go to the publisher’s website, Quirk Books, not Amazon. I like Amazon, but when I’m purchasing books from small publishers or nonprofit/religious publishers such as Orbis or Augsburg Fortress, I prefer to purchase from the publisher directly. In this way the publisher gets more money from the sale (rather than sharing their proceeds with for-profit megasite Amazon.com), which in the case of Orbis and Augsburg Fortress provides them with more funds for their ministry of publishing. Quirk Books is not religious, but it is small and, well, Quirky, and I figure that I could better support their cool line of books by purchasing from them directly . . .
BTW, my wife is cracking up right now as she reads Quirk Book’s Haiku Mama, a hillarious collection of haikus about parenting . . . This entry was posted in Etcetera, Faith & the Church. Bookmark the permalink.